My belief in a holistic approach to patient care is driven by the idea that all body systems, especially the musculoskeletal system, are important to my patient’s well-being and quality of life. Dr. Maxson is fellowship trained and board certified by the American Osteopathic Board of Orthopaedic Surgery. Dr. Maxson focuses on a holistic approach to patient care, recognizing that all body systems are interconnected and that the musculoskeletal system is especially important to wellbeing and quality of life. Dr. Maxson focuses on Orthopedic Trauma as well as General Orthopedics, and he specializes in treating complex fractures, correction of limb deformity, as well as a variety of other common orthopedic complaints. 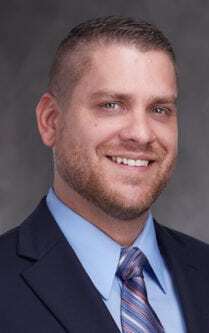 A guest lecturer for the Ohio Occupational Therapists Association, Dr. Maxson has also presented at the American Osteopathic Academy of Orthopedics Scientific Poster Session and authored articles on upper extremity injury, repair and treatment. After completing a residency in orthopedic surgery with Grandview Medical Center in Dayton, Ohio, Dr. Maxson completed a fellowship in orthopedic trauma at Florida Orthopaedic Institute. Dr. Maxson studied medicine at Lake Erie College in Pennsylvania, where he was a distinguished member of Psi Sigma Alpha National Osteopathic Scholastic Honor Society and received additional training on osteopathic manipulative treatment (OMT), a hands-on approach to diagnosis and treatment as well as disease prevention. He obtained his Bachelor of Science in Biology from Grace College and Theological Seminary in Winona Lake, Indiana. 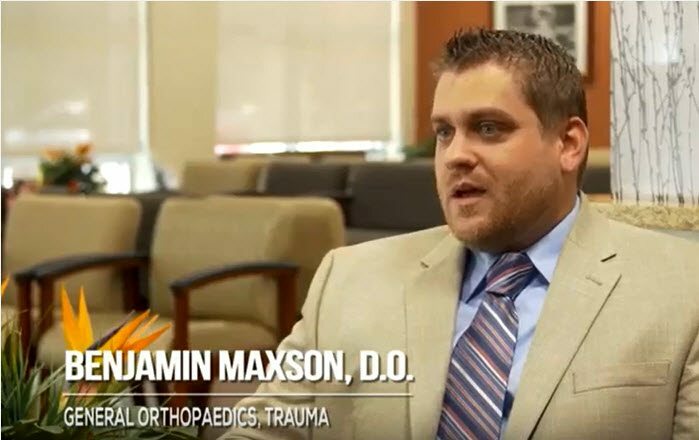 Dr. Maxson is a member of the American Osteopathic Association, an American Osteopathic Trauma member and a candidate member of the American Osteopathic Academy of Orthopedics. In his free time, Dr. Maxson enjoys spending time with his wife and two daughters. Splendid outcome for emergency femur fracture of a 96 year old patient. Great surgeon, wonderful bedside manner. Outstanding follow-up. Highly recommend him. Excellent treatment and consideration of all questions I ask during my appointment with Dr. Maxson. I would definitely recommend Dr. Maxson to all of my friends who may need orthopedic services. I have been going to Florida Orthopaedic Institute in Citrus Park for over a year now and I have never waited more than 10 minutes in the waiting room. Dr. Maxson has been a great doctor. He did a double knee replacement on me in the beginning of January. I was back to work in a month feeling great. The therapy really helps! My mother and I always enjoy seeing Dr. Maxson. He’s so good at what he does, but he also makes it fun to see him. He also takes our pain away. Dr. Maxson provided excellent treatment with compassion. Dr. Maxson did an excellent job throughout the process of diagnosing and treating my knee. In April of this year, I had a shoulder surgery performed by Dr. Maxson. He exceeded all my expectations. In every visit he took time to explain to me what the next step was and he made sure that I understood. The day of surgery, he spent time with me reassuring me and answering questions. Surgery was successful and after 12 weeks I am doing great. The pain that brought me in is gone! Dr. Maxson was friendly, professional and punctual. I would also like to mention the great work of his assistant Maria Iglesias. She took care of my disability papers efficiently and promptly. I never had to ask twice for anything. I definitely recommend Dr. Maxson. Not only is he professionally and technically outstanding, but he never forgets the human aspect of his practice. Thank you very much! You have a great training program and each person is courteous, concerned, kind, considerate and compassionate. I pray this is contagious and every medical facility contracts this bug. Thank you! Dr. Maxson is a very caring physician. He is very nice, easy to understand and detail oriented. From the start, I had an excellent experience with Florida Orthopaedic Institute. Of course, if I have a need in the future, I will call them and Doctor Maxson. Dr. Benjamin Maxson is truly the best. He did a tremendous job putting together my left leg after I was severely injured in an automobile accident. Through his outstanding surgical skills, his caring and compassionate follow-up, I feel I will be able to walk again one day soon. Thank you Dr. Maxson! I believe he is the best trauma orthopedic surgeon in the area! A++ doctor, great bedside manner, and explains everything for you to understand. He did a knee scope and a week later I felt great. So glad you treated me, thank you! Highly recommended! In July 2016 I scheduled an appointment with Dr. Westerfield to examine my right knee. After x-rays he indicated that my knee was not the problem; it was my right hip. After vetting surgeons, I made contact with Dr. Benjamin Maxson to discuss hip replacement. He thoroughly explained the process which needed to be followed in order to meet Medicare requirements. Ultimately, surgery was complete on December 14, 2016. Throughout the entire process, I was supported by Dr. Maxson and PT staff. My pain level was minimal. I was able to progress rapidly from a walker to a cane to no assistive devices – five weeks! During my second post-surgery visit with Dr. Maxson on February 2, 2017, he released me to go back to full activities. It took only 50 days to go from severe hip pain to total recovery. I would recommend that anyone in need of hip replacement consider Dr. Maxson and the Florida Orthopaedic Institute! Thanks to Dr. Maxson and all staff. Life is so much better now. Dr. Maxson is a wonderful doctor to whom I would like to thank for taking care of my right knee and being an awesome doctor. Dr. Maxson is very caring. He was very patience explaining options and the process about my shoulder injury. His assistant Marie has great customer service skill. I feel she genuinely cares about the patients. The physical therapists Shannon and Stephen in the Brandon are wonderful. They really want you to get better.